Click on the image to flip through the 2013 Templeton Chamber Guide. 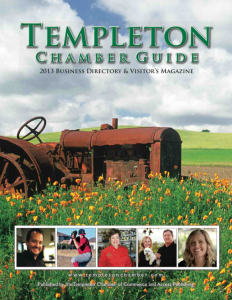 Feb. 15, 2013–The new 2013 Templeton Chamber Guide is being delivered this week. It’s an exclusive magazine for residents and businesses of Templeton, Calif.
Access Publishing creates the magazine annually with the help and co-operation of the Templeton Chamber of Commerce. It includes recommended businesses, maps, events, news and profile of local residents. It is being mailed to every business and residence in the 93465 zipcode this week to reach everyone in town. The guide will also be available in 40 businesses around town and restocked throughout the year. “I’d like to thank the Chamber’s new executive director, Berdette Robison, for making this year’s magazine a huge success,” says Scott Brennan of Access Publishing. ” She worked very hard writing and editing the articles inside the guide.” “I would also like to thank the other authors, photographers and contributors including Beth Brennan, Karen Battaglia, Nona Cantalupo, Sally Giordano, Doug Swarts, Martha Neal, John Crippen, PJ Sawyer, Maria Eskandanian, Nancy Fiske, Robert Rosales, Brandi Stansbury and graphic designer Jane Johnson,” Brennan says. “It would not have been possible without the hard work of everyone involved,” he says. The magazine brings together residents and businesses who offer services in Templeton, including those from surrounding areas like Paso Robles, Atascadero and San Luis Obispo. Advertising rates are affordable to encourage local businesses to use the guide to promote themselves in this exclusive community. “If you want to reach Templeton, this an excellent part of your business marketing plan,” says Brennan. To request a copy of the Templeton Chamber Guide or for advertising information, call Access Publishing at (805) 226-9890.